I just found your blog and it is awesome! Thank you so much for the great tutorials!!! This is awesome. Do you know how to convert the WS row to knit in the round? Check out the tutorial in the tab at the top of the blog. Hope that helps! I did and unfortunately, after following the directions, it's not helping at all. lol I've been at this since last night. I'm beginning to think perhaps this stitch is not meant to be knit in the round... not according to these instructions, anyway. Thanks so much. Great site! Any stitch can be worked in the round, even this one. Keep in mind that wrong side rows need to be reversed, since when working in the round you are always seeing the right side. For instance when you make a p2tog on a flat piece, it makes a right slanting stitch appear on the front. Since the front is always facing in the round, to make a right slant you change the p2tog to a k2tog. Why don't you try looking at The Purl Bee's Big Herringbone Cowl - it uses the herringbone stitch and they have a photo tutorial on working it in the round. It really looks pretty much the same as this stitch. Dear Sapphires-N-Purls, I like this Little Herringbone stitch a lot. I knitted a sample in chunky baby alpaca, which is a little too fuzzy to show the stitch well. 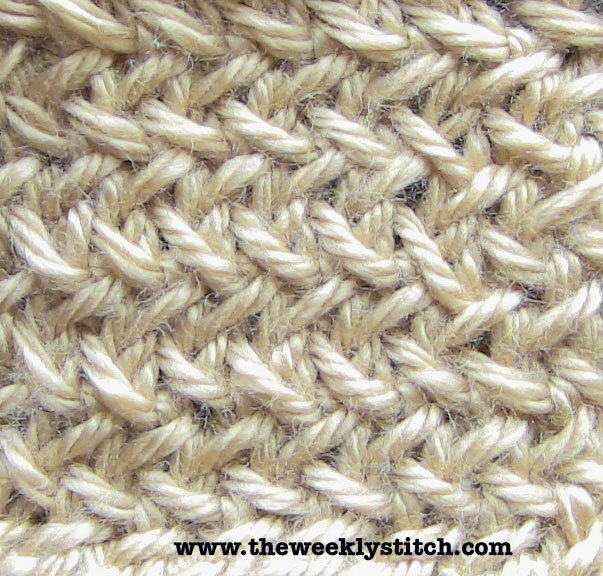 I found this stitch while hunting down what was called the "woven cable stitch," demonstrated by Eunny on Knitting Daily TV, Episode 909, Bobbles and Baubles. The blog says the stitch Eunny showed came from Interweave Knits Fall 2012 from a Fedora Hat pattern. But I can't be sure this is the same. 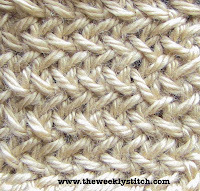 The Fedora is not listed in contents, and everything I've found among stitch patterns called "Woven Cable" looks nothing like the stitch Eunny demonstrated. The magazine is $14.99 and the last thing I want to knit is a Fedora Hat. Other contents not my bag, either, really. The stitch knits up a thick fabric with XXXXXXs running across. It wasn't complex. I thought I had it from watching TV, but I must be missing some YOs. Eunny demonstrated the stitch muy rapido as the "Quick Tip" at the end of the show. Camera angles weren't helpful and no further help is forthcoming. Can you help me find this stitch? Or even better, do one of your spectacular teaching tutorials? The stitch would make a great gentleman's scarf. The best thing about this search is that I found iknitwithcatfur on The Weekly Stitch, and now I'm exploring Sapphires-N-Purls. I'm knitting a scarf with Irish Mesh. Thanks for clearing up Old Shale vs. Feather and Fan, and many other thanks, as well. You are a superb teacher. I look forward to exploring your stores. I can't tell from the picture of the fedora hat what the stitch is exactly. I do not have KD in my area available to watch in the TV, so I haven't seen the episode you mentioned to see what Eunny demonstrates. Have you tried looking at knittingfool.com? There are hundreds of stitches with pictures, you may find the stitch you're looking for. Unfortunately stitches are often called different names, and it can be hard to track it down. You may also want to post on the KD forums as someone there may be able to give you more info on that stitch. Sorry I can't be of more help. Good luck in your search! Thank you, Sapphires-N-Purls! I'll try knittingfool.com, perhaps then the KD forum. I would buy the magazine from the KD website if I was sure it had what I'm looking for. The variable names ARE confusing, similar to names of old quilt blocks, but probably a story behind each name. I thought it might ring a bell with you since you're vastly more experienced than I. I'm a winter knitter who lives in a remote fishing village where cable is out a lot, and I just happened to land on that KDTV episode. I didn't even know who Eunny was. Oh well, my quest has helped the endless winter go by. Loving your Irish Mesh and Old Shale, meanwhile, with many other iknitwithcatfur videos to follow. Thanks again. I somehow have lost a stitch in each row I do. Any thoughts on what I'm doing wrong?